We played our first gig as the Blackstone Valley String Quartet on October 15th, 2016! Since then we have played nearly 50 gigs as the BVQ! The Blackstone Valley String Quartet gets its name from the quaint small-town area of Central Massachusettswhere all members of the group grew up and fostered their musical talents together. 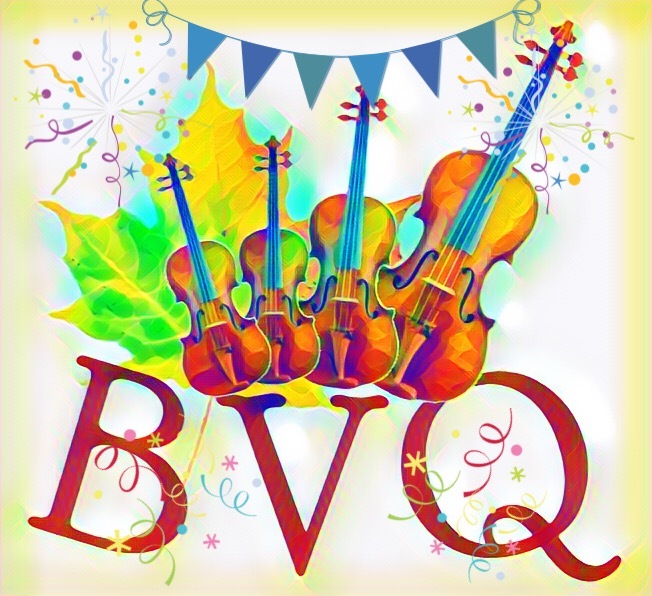 For fifteen years, the members of the BVQ have played together in various orchestras and small groups honing their skills and developing a unique bond as professional performing musicians. The BVQ currently serves all of New Englandincluding the cities of Worcester, Boston, and Providence, and can be booked for all types of events including wedding ceremonies and receptions, private parties, and corporate/professional events. The BVQ is located in North Grafton, Massachusetts. We love tailoring our services to the needs of each and every event, providing music of all genres. Your event will get personal attention to details that will reflect your style. Live music at an event makes a huge impression. Having live music at your event is more affordable than you might expect! We offer many different options for combinations of instruments and packages to fit every budget! Our first photo shoot in Fall 2016. We hadn't found a full time cellist yet, but that would soon change! L-R: Sylvia DiCrescentis, Kathryn Haddad, Brittany Stockwell. On December 4th, 2016 we performed in the Grafton Country Store during Grafton Celebrates the Holidays! L-R: Brittany Stockwell, Sylvia DiCrescentis, Owen Cooper, Kathryn Hadded. After our performance at the Whitinsville Christian School Christmas Concert at Valley Chapel in Uxbridge with our current cellist Jamie Thiesing! L-R: Kathryn Haddad, Jamie Thiesing, Sylvia DiCrescentis, Brittany Stockwell. Sylvia, Brittany, and Kathryn spent a week in Grafton, Vermont during February to work on music videos for the BVQ's sister project, Indigo Heart. Sneak peek of the BVQ's first community concert that took place on June 4th, 2017 on the Grafton Town Common! Our first photo shoot with Jamie as our cellist! L-R: Brittany Stockwell, Kathryn Haddad, Sylvia DiCrescentis, Jamie Thiesing. The BVQ during their first community concert on June 4th, 2017 on the Grafton Town Common! L-R: Kathryn Haddad, Brittany Stockwell, Sylvia DiCrescentis, Jamie Thiesing. Our summer was full of gigs! Wedding ceremony in Vermont with one of our ensemble members, cellist Ben Thayer. L-R: Brittany Stockwell, Sylvia DiCrescentis, Ben Thayer. Before our performance on the Milford Youth Center Telethon on Milford Public TV. L-R: Brittany Stockwell, Jamie Thiesing, Kathryn Haddad, Sylvia DiCrescentis. Before playing a wedding in New Hampshire during a torrential rainstorm with ensemble member Caitlin Leffingwell! L-R: Jamie Thiesing, Sylvia DiCrescentis, Brittany Stockwell, Caitlin Leffingwell. Enjoying Newport, RI before playing a wedding ceremony! L-R: Jamie Thiesing, Brittany Stockwell, Sylvia DiCrescentis, Kathryn Haddad. After our performance at the Arts & Music Makers Festival at ValleyCAST! in Whitinsville! After playing a wedding ceremony in Vermont with ensemble members Susan Kirchhausen, Will Hayes, and Lynne Canavan. BVQ violist Sylvia DiCrescentis on far right. Our most recent photo shoot at the Grist Mill at the Wayside Inn in Sudbury. L-R: Brittany Stockwell, Sylvia DiCrescentis, Jamie Thiesing, Kathryn Haddad. After our second community concert at West End Creamery in Northbridge on Friday October 13th! Check out the live stream on our Facebook page by clicking here! We are currently booking gigs for the 2018 calendar year and are already pushing towards passing our gig numbers from 2017! If you are interested in hiring live musicians for your event contact our Booking Manager Sylvia at blackstonevalleyquartet@outlook.com for more information on our packages! We offer various instrument combinations including strings (violin, viola, cello, guitar) and piano! Sign up for our weekly newsletter to get updates on our upcoming community concerts and public gigs by scrolling to the bottom of this page and clicking the link! A huge thank you to our friends, family, & fans for supporting us! Your encouragement, support, and love keeps us going! We look forward to sharing many more years of music with you!